We sing Sea Shanties, Songs of the Sea and Cornish Songs mostly for the love doing so but also to maintain age old traditions - keeping alive the history of Tall Ships and the days of sail. 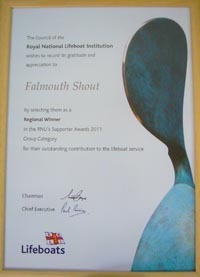 'Falmouth Shout' takes its name from our groups strong connection with Falmouth Lifeboat. The 'Shout' being a lifeboat call or perhaps it is just the way we sing. We can liven up any occasion; performing at festivals, events and concerts. 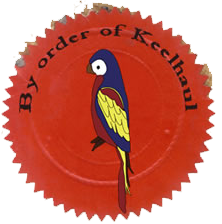 Sign up for a life before the mast and let us take you on an virtual journey around the world, sing the songs of a bygone age and revel in the romance of daily floggings, weevily bread and bucko bosuns on you back! Any funds we raise are distributed to local and other charitable and social causes. As founders of the Falmouth International Sea Shanty Festival we have raised over �40,000 for the RNLI.